Hands down my favorite attraction in Buenos Aires is to walk around Palermo Soho. 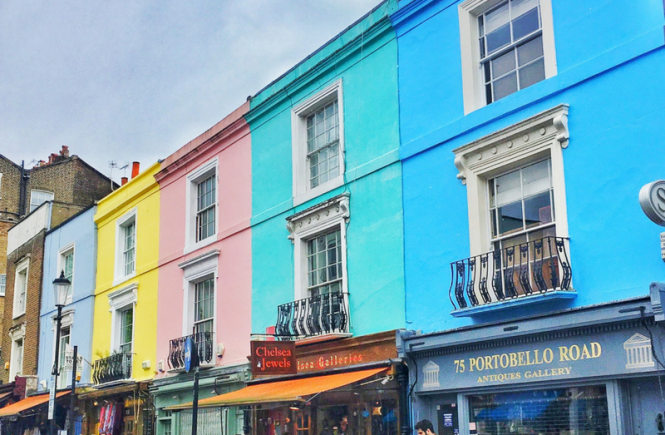 Similar to the Soho in London and New York, Palermo Soho is bustling with independent designer stores, trendy restaurants & cafes and colorful façades. Start from Plaza Armenia and make your way to Plaza Serrano. There are just dozens of places to eat from all cuisines and types, and most of them are good. Just pick one you fancy and check the reviews in Google Maps. 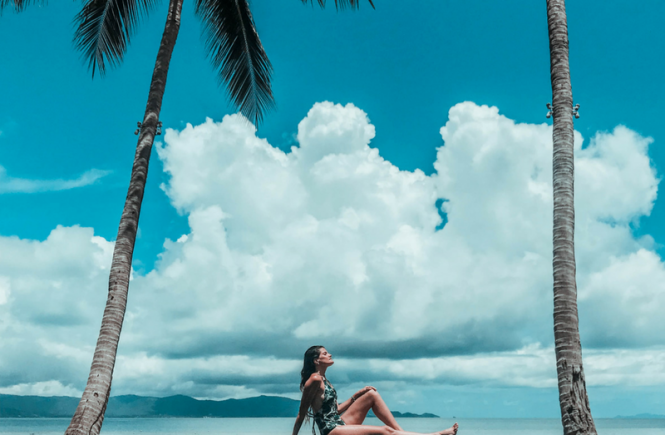 My go-to places are Mark’s Deli, Fifi Almacen, Pani…but there are so much more! One of the most touristy attractions in Buenos Aires, but still worth it. 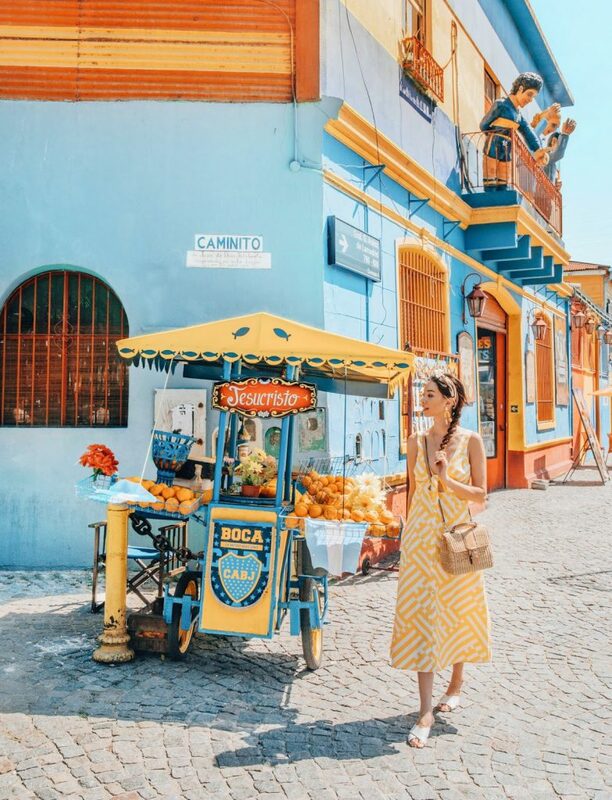 Caminito is a street in La Boca filled by colorful painted houses. The houses, made of wood and sheet metal, are remains from the “conventillos” or communal houses built by Italian immigrants in the 19th century. There are also tango shows to watch, and traditional restaurants to eat in. My mum is from La Boca and even lived in a conventillo when she was a child, so this neighborhood and its history are very dear to me. Football, well Fútbol as that’s how we call it, is life for many in Buenos Aires. Boca Juniors & River Plate are the most popular teams in all of Argentina, and rivals. Watching a Boca Juniors match is in my opinion a unique goosebumps-level experience. The fans for Boca Juniors are so intense they are called “la 12” or the 12th, as of in they are considered a 12th player in the field as their support can help turn around a match. You can check and book tickets here. If there are no games when you visit and you are a football fan, you can also do a tour of the stadium. MALBA – Museum of Latin American Art of Buenos Aires – has an impressive permanent collection. My favorite museum in Buenos Aires and very worth spending a couple of hours admiring it. Every Monday for now over 12 years La Bomba Del Tiempo, a band comprised by over 17 percussionists, has been delighting locals and foreigners with their beats in the Ciudad Cultural Konex. 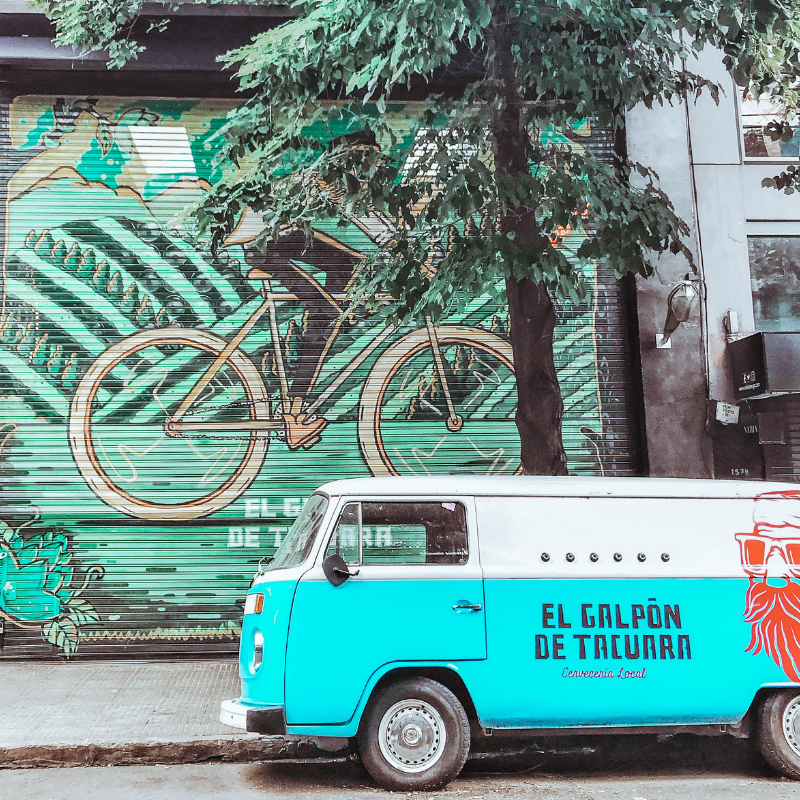 If you want to get a feel of how alive Buenos Aires is and how much porteños love going out, head to La Bomba on Monday – get tickets here. Can’t do Monday? Don’t worry, Santiago Vazquez the creator of La Bomba also does a similar show called La Grande on Tuesdays in Santos4040 – get tickets here. Both venues sell drinks, food and are just loads of fun. 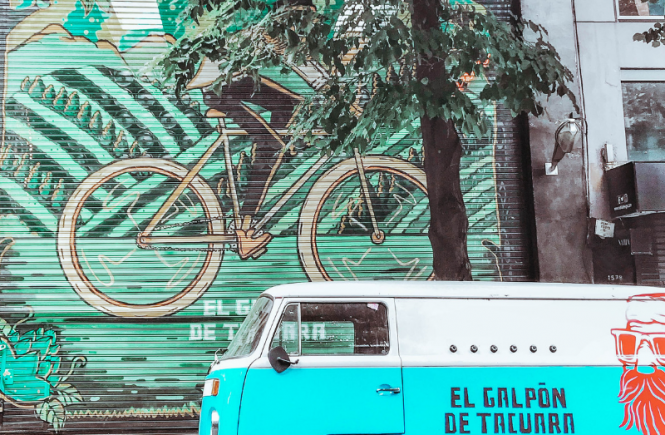 Sundays are the best day to visit San Telmo, because while San Telmo Market is open every day, Plaza Dorrego Flea Market is open on Sundays only. You’ll see tango dancers, performing artists and an array of antiques as well as great food. This is one of Buenos Aires must dos. Empanadas are the go-to food item in Argentina. We eat empanadas all the time: with friends, at home, as an appetizer for asado, etc. Because of that, you gotta try them! Empanadas are generally good everywhere but if you want to ensure you are trying a really good one try La Cocina, La Morada or De Rosa. 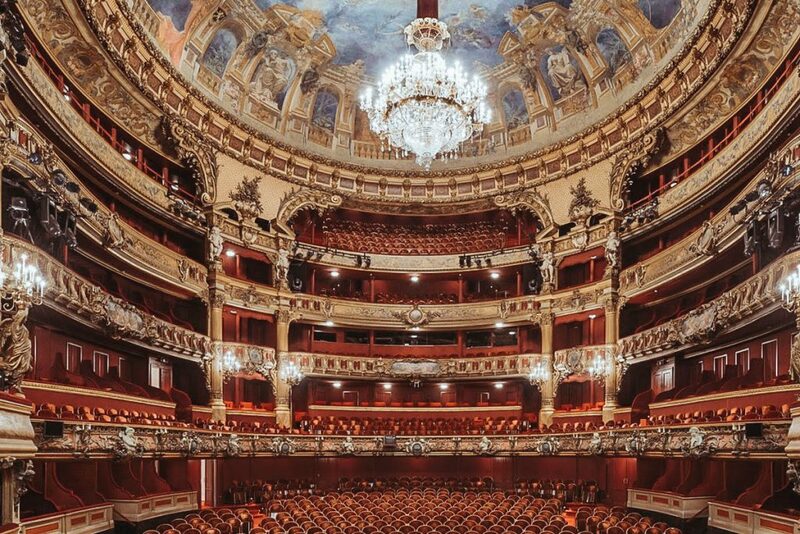 Another one of the top attractions in Buenos Aires and one of its most important landmarks is the magnificent Teatro Colón. It is considered one of the ten best Opera houses in the world. I would encourage you to see an opera or ballet – you can book tickets here – or take a tour of the theatre. One of the world’s best cemeteries, you’ll be amazed by the mausoleums, sculptures and detail of this cemetery. It is death portrayed in it most beautiful form. I encourage you to take a tour to understand more about its story and its quiet inhabitants. One of the most fun things to do in Buenos Aires in my opinion is to visit it’s unique bars. Go back to the times of the Prohibition through a telephone box at Frank’s. Drink at a steampunk speakeasy at Victoria Brown. Have cocktails at a flower shop in Florería Atlántico. Get your booze fix in a New York pharmacy which you’ll enter from a subway carriage at Uptown. It is considered one of the most beautiful bookshops in the world, and that’s because it used to be a theatre. 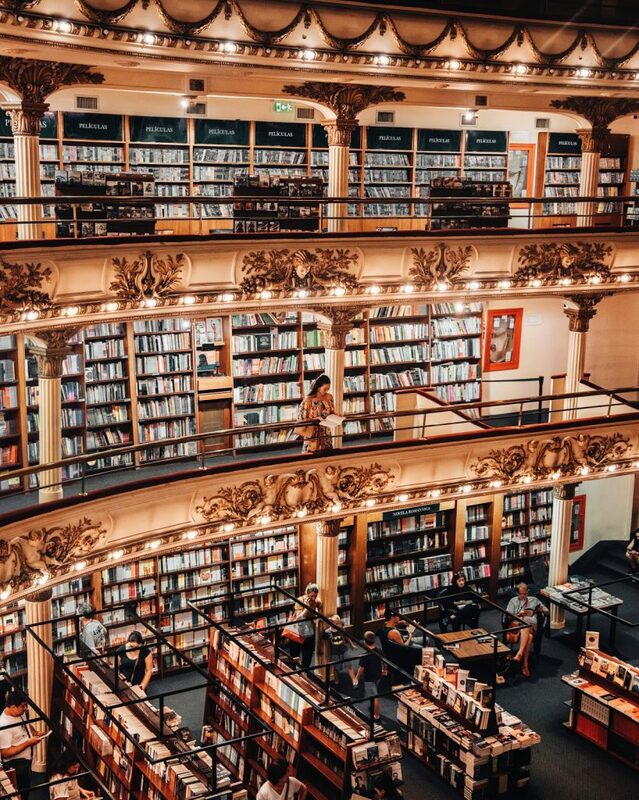 Definitely a great place to buy a book, or just take a really good picture while in Buenos Aires. Do you want a try a pizza like no pizza you’ve ever tried before? Time to take a bite of an Argentine pizza. Our pizza is thick, cheesy to levels you could have never imagined and it has olives on top. We also have some special types of pizza like the fugazzetta, a pizza filled with lots of cheese and with lots of onions on top. We also eat a lot of fainá, a chickpea pancake which we usually put on top of the “muzzarella” which would be the Argentine version of the margherita. You must go to try our pizza to El Guerrin, El Cuartito or Las Cuartetas. A pizza place I love which is not as famous is Pirilo and it’s close to the San Telmo market. Tigre is a town in Greater Buenos Aires which lies on the Paraná Delta. As such it has a unique scenery, there are streams flowing everywhere as well as islands. As it’s not that easy to reach on public transport own I’d recommend you book a tour which includes a boat ride through the islands. 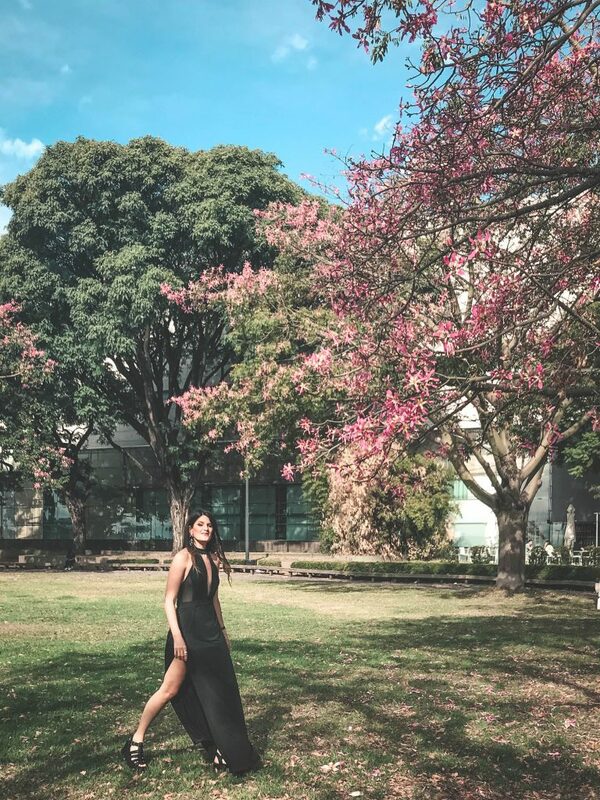 El Rosedal is a rose garden located within a big green area within the city called Bosques de Palermo. It’s such a pretty place, because of the roses, water fountains, white veranda and bridge. If you are in need of some nature, give it a visit. 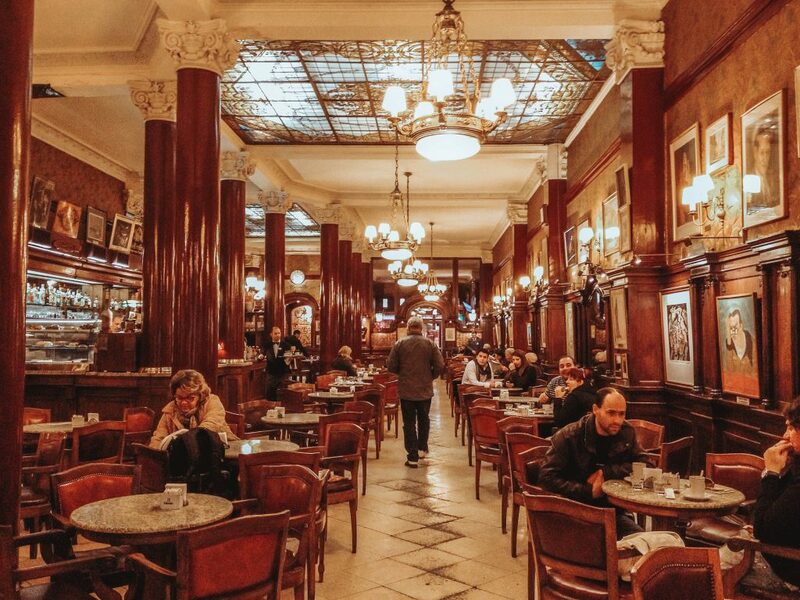 One of the oldest cafes in Buenos Aires, being around since 1858. Have “cafe con medialunas” or coffee and croissants or chocolate con churros. 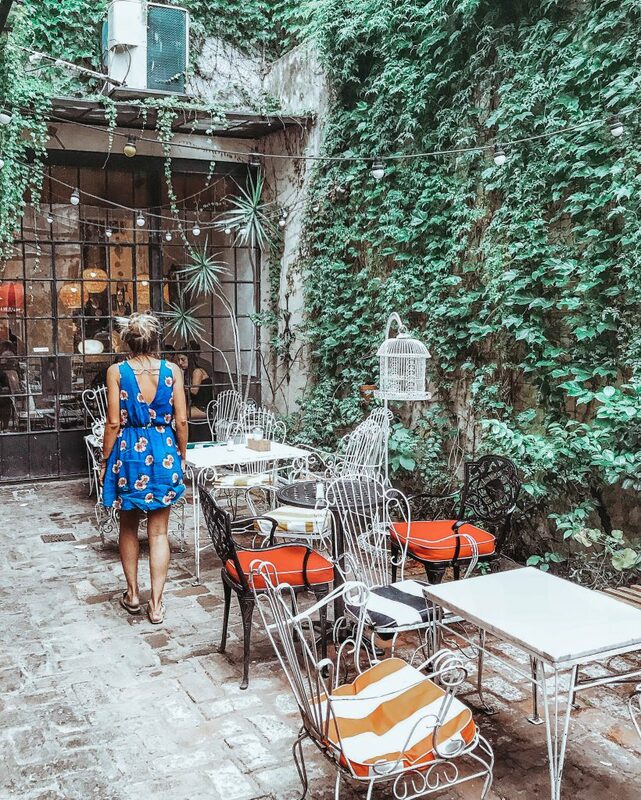 Put Cafe Tortoni in your culinary Buenos Aires Bucket List. La Casa Rosada (Pink House) is the main government building in Buenos Aires, and where the President works on weekdays. However, you can visit it on weekends where there are guided and free walking tours which you can book here. Plaza de Mayo is the square where La Casa Rosada sits, and as you might imagine, where demonstrations happen. Argentines love to demonstrate and its likely there will be some closed streets close to this area due to some kind of demonstration. Facturas are pastries of different kinds which Argentines love. We buy them by the dozen (you can buy half or a quarter dozen as well). Medialunas (croissants) are the most common factura and we have two different kinds. The “Medialunas de grasa” (fat based croissants) are thinner and longer than regular croissants, and less moist, potentially a bit less sweet. The “Medialunas de manteca” (butter based croissants) are plumper, shorter and are usually painted with syrup, so they are sweeter. You might want to try the “cañoncito de dulce de leche” and “alfajorcitos de maizena” both are dulce de leche filled pastries. The best places where you can buy these are Confitería Dos Escudos (various locations), El Galeón, Santa Paula, La Argentina (various locations) or Ritz. Include the Museum of Fine Arts of Buenos Aires in your list of places to visit in Buenos Aires. It features art from renowned South American painters, as well as from Monet, Degas and Picasso among others. Plus, it’s free! The Obelisco or obelisk is the most iconic monument of Buenos Aires. 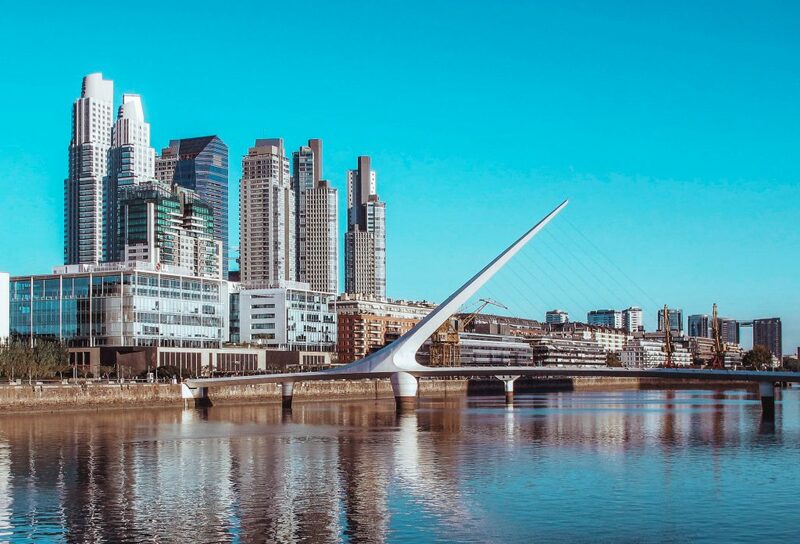 It stands at the intersection of two of the city’s most important streets: Avenida Corrientes and Avenida 9 de Julio, the widest street in the world with an incredible 16 lanes. If you are looking for a picture that says “I’ve been in Buenos Aires” this is it! Then, walk for a bit to get to Puerto Madero. This is the port area which has been refurbished and is now one of the fanciest places in Buenos Aires. Just take a stroll besides the river, cross the Puente de La Mujer (Woman’s Bridge). There are many restaurants by the river where you can eat. You might have picked up by now one of the best things to do in Buenos Aires is eat! First, you must try Dulce De Leche which is similar to caramel but just better. We eat it with everything: on toast in the mornings, on pastries, with chocolate, inside alfajores, on cakes and on desserts. If you are eating at a traditional Argentine restaurant ask for “panqueques con dulce de leche” or “flan con dulce de leche” for dessert. Then let me introduce you to alfajores, these are essentially two round cookies with a filling. Most typically, the filling is dulce de leche, and they can be bathed in chocolate or powdered sugar. You can buy them in our “kioscos” essentially small convenience stores that you can find on almost every street. Last our ice cream is incredible, and I am by no means overstating it. We love ice cream and we eat it all year long. We buy it by the kilo and just keep it in our freezers. The best ice cream is from Freddo, Volta, Persicco, Rapa Nui and Cadore. Of course, you need to have Dulce De Leche as one the flavors. The Jacuzzi at 248 Finisterra. Shop my bathing suit. 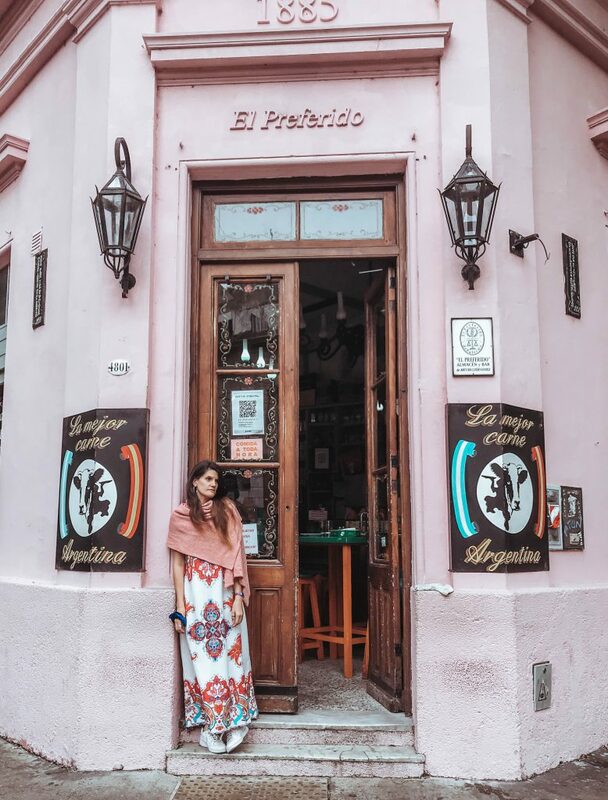 I highly recommend you stay in Palermo in order to make the most of your time visiting Buenos Aires as there is an incredible amount of great restaurants, bars and stores there compared to other areas. If you are looking for self-catering and cheap accommodation in a perfect location in Palermo then I wholeheartedly recommend you stay at my Mom’s Airbnb. She recently bought and renovated this studio apartment which is lovely and she is a wonderful host. If you don’t believe me you can look at her raving reviews on the room she rented in her house before getting this studio. If you are looking for something fancier, I’ve stayed in two boutique hotels in Buenos Aires which I recommend, both in Palermo. The first one is 248 Finisterra which is located right in the heart of a sub-area within Palermo called Las Cañitas which is full of cool restaurants and bars. The hotel has a very homey vibe. On the ground floor there is a cozy living room and a beautiful garden. The rooms are very simple but they have everything you might need. 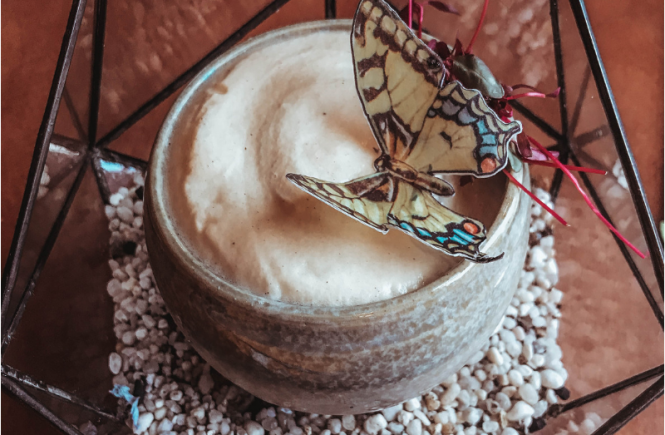 On the first floor, there is a terraced garden with a jacuzzi for which you can regulate the temperature where I have seen hummingbirds visit. The breakfast is great and consists in various types of local pastries, fruit, bread, cold meats, cheese and great coffee. I really enjoyed saying at 248 Finisterra particularly the jacuzzi in the terrace as well as being able to reach so many restaurants and breweries without needing to walk much. You can check out and book 248 Finisterra here. The pool at Mine Hotel. Shop my bathing suit. The second hotel I stayed in was Mine Hotel. This hotel is located in Palermo Soho, my favorite area in Buenos Aires. It’s similar to Las Cañitas in terms that it has many restaurants and bars, but it’s bigger and more scattered and also has many designer stores so is also good for shopping. The hotel itself was great, I loved the colorful and eclectic decoration in the common areas and rooms. Particularly enjoyed the emerald coloured pool at the garden in the back, perfect for some refreshment after a hot day. Breakfast was also pretty incredible, there was so much variety and also some original items such as chia pudding, overnight oats and toast with different toppings. I was surprised to see so many vegan friendly options – they even had a plant milk for my cappuccino. You can check out and book Mine Hotel here. You can really only get to Buenos Aires by plane, let’s face it, it’s pretty darn south compared to anywhere else in the world. Ok, Uruguay is the exception as you can get to and from Buenos Aires to Colonia in Uruguay in around an hour. 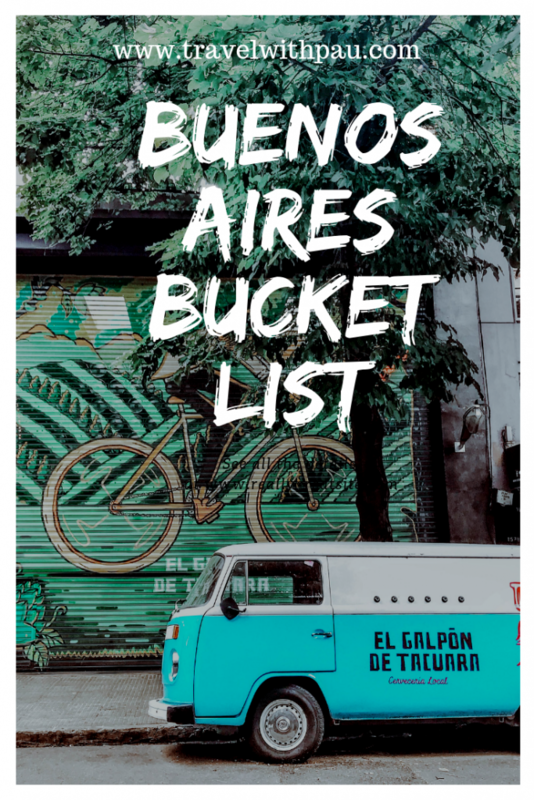 I’ve been flying to Buenos Aires from London and other places in the world at least once a year for the past five years and I am witness that Momondo always has the best deals. So make sure you use Momondo to find your next flight to Buenos Aires. Finally made it to BA and loving your post! I’m going to get fat here! Fabulous info!!! Thanks!